PT Bank Tabungan Pensiunan Nasional Tbk - BTPN or referred to as "Bank BTPN" is a rapidly expanding financial services company in Indonesia with core business focus on general banking industry. 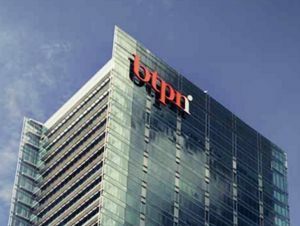 Headquartered in Jakarta, Bank BTPN runs its business through four business segments: BTPN Purna Bakti (pension business), BTPN Mitra Usaha (Micro Business), BTPN Mitra Bisnis (SME business) and BTPN Sinaya (funding business). Bank BTPN was incorporated in 1958 with main business to served retired military personnel under the name of Bank Pegawai Pensiunan Militer (BAPEMIL). In 1986, BAPEMIL was officially organised under the name of Bank Tabungan Pensiunan Nasional. Later in 2008, Bank BTPN has been listed in Indonesia Stock Exchange with stock code of “BTPN”. As of December 2015, 40% of its shares are owned by Sumitomo Mitsui Banking Corporation, 20% by Summit Global Capital Management B.V., 8.38 % by TPG Nusantara S.a.r.l, and 31.62 % remaining shares by public shareholders. Bank BTPN’s business results in the full year of 2015 showed improved performance compared to the same period at 2014. According to PT Bank Tabungan Pensiunan Nasional Tbk Annual Report 2015 as cited by JobsCDC.com, Bank BTPN registered total asstes of Rp 81,039.66 billion at the end of December 2015. This reflected an 7.97% increase from Rp 75,059.22 billion at the end of December 2014. Minimum Bachelor Degree (S1) with a Grade Point Average (GPA) of minimum 3.00 out of 4.00 scale. Have high self-confidence and excellent communication skills. Willing to follow the stages of education and training programs continuously for 6 months and pass the exam. Willing to undergo a bond for 24 months, after passing the stages of education and training programs. Copies of ID Card and NPWP. JobsCDC.com now available on android device. Download now on Google Play here. Please be aware of recruitment fraud. The entire stage of this selection process is free of charge. PT Bank Tabungan Pensiunan Nasional Tbk - Fresh Graduate Development Program BTPN June 2016 will never ask for fees or upfront payments for any purposes during the recruitment process such as transportation and accommodation.